Like Revolution, Goose Island, and Half Acre before it, Old Irving Brewery brings another unique craft brewing experience to the northside, this time settling into the historical neighborhood of Old Irving Park, which is located on Chicago’s Northwest side. Once a hub for Chicago's upper class, Old Irving Park and neighboring Portage Park have seen businesses come and go. When the large banks that dominated the neighborhood shuttered their doors and suburban malls began expanding, Six Corners stopped bringing as many people to the area. Efforts to revamp what was once the second-biggest shopping district outside of the Loop have been ongoing for decades, but only in the past several years have they begun to pick up. Old Irving Brewing was initially the pet project of famed resident Homaro Cantu, but after his untimely death in the spring of 2015, its grand opening seemed less and less likely. Old Irving resident and co-owner Jeff Linnemeyer wanted to continue his investment in the brewery because it would keep people in the neighborhood, so the brewpub finally opened in the fall of 2016. Conveniently located less than a half mile from the Montrose Blue Line stop, the 8,500 sq ft brewery offers a variety of craft brews, twists on classic cocktails, and a food menu that ranges from the standard pub burger to Wood Fired Spanish Octopus. There’s also a taproom, beer hall, and game room, complete with a great view of the brewhouse. 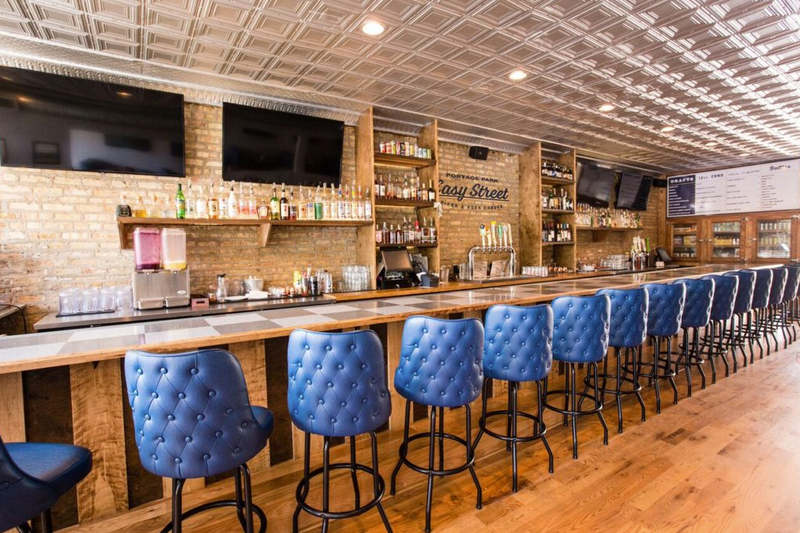 What was once a downtrodden watering hole for 71 years, Easy Street re-opened its doors in the summer of 2017 to offer Portage Park residents something a bit different: a trendy pizza joint and beer garden. 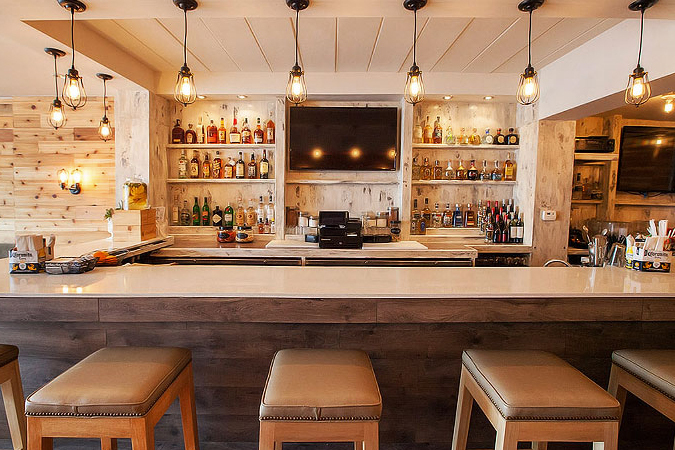 Diners can sip on craft cocktails, build their own pizza, or choose from a list of specialty pizzas, sandwiches, and salads. The restaurant group that brings Easy Street to the area is behind other restaurants such as Irving Park’s Pitchfork and Roscoe Village’s Waterhouse Tavern & Grill. The open restaurant features exposed brick walls and comfortable booths as well as a full service bar and the main attraction — the outdoor beer garden. The atmosphere is relaxed and offers plenty of options for sports fans. For a more casual experience for stopping along your commute, look no further than Bistro 6050. A worldly street food cafe that opened in Portage Park in early 2017, Bistro 6050 is inspired by food cart flavors from around the world. 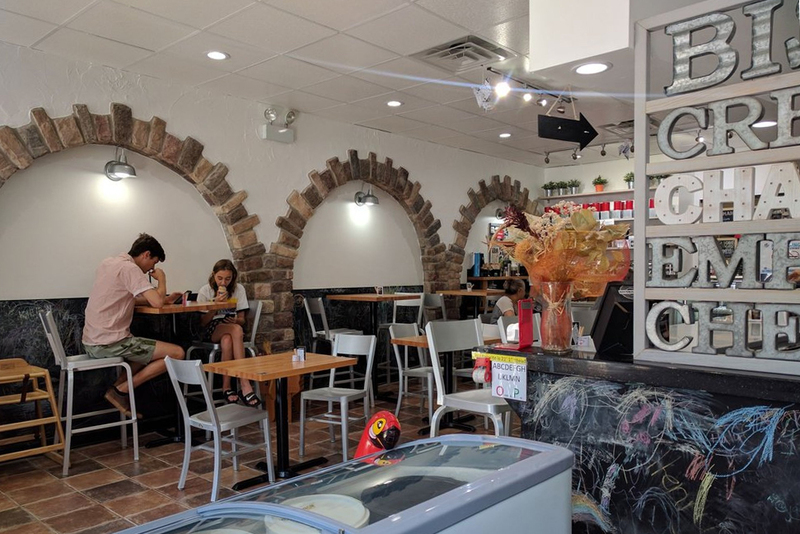 One-third cafe, one-third world market, and one-third snack bar, this new addition to the Irving Austin Business District serves everything from empanadas to bubble tea, as well as cafe staples like espresso drinks. The storefront is modern, open, and bright, advertising their “charcoal nuts” in marquee-style lights. Described as a “hidden Northwest Side gem,” Bistro 6050 brings tastes from around the world to an area that is beginning to experience its own renaissance. Fans of rock ‘n’ roll, gourmet burgers, and craft beer rejoice! BRGRBELLY is a classic burger & rock joint along the lines of Avondale’s Kuma’s Corner and Ukrainian Village’s Lockdown. 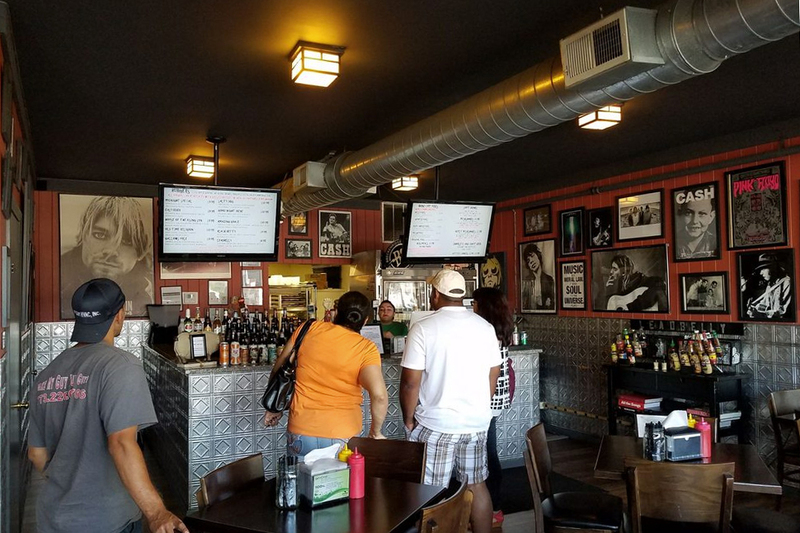 The burger stand first opened in 2013 at the Portage Park location and has since expanded to an Italian beef restaurant and ice cream shop. They’re also in the planning stages of developing BRGRBELLY into a chain with four downtown locations. 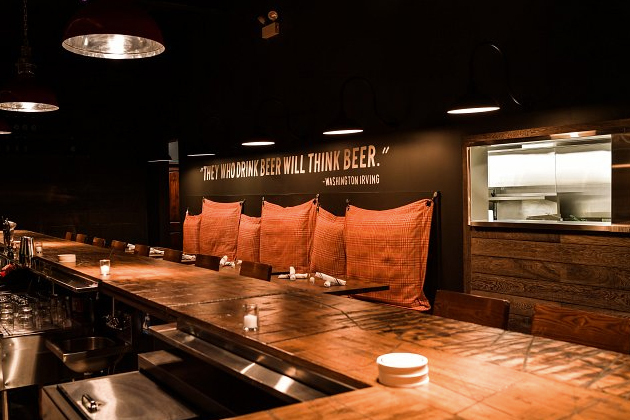 Inside, guests can choose from one of several craft beers on tap or bottled craft beer (over 40 to choose from). Boozy milkshakes are also available for dessert. The interior is decorated with band memorabilia complete with a large projector screen on which live concerts are shown throughout the day. Not a red meat person? Any of their burgers can be made with hand-battered chicken or a vegetarian patty. Mexican food in Chicago has a rich history and Cook County is home to the third-largest ethnic Mexican population in the United States. Inspired by the success of Big Star, Cochinita owner and Old Irving resident Quay Tao opened Cochinita Taco Co. in 2016 in the former storefront of The Portage, also owned by Tao (He also owns the neighborhood’s upscale Community Tavern, named one of Chicago’s best new restaurants in 2015 by Chicago Magazine). Located a block from Portage Park itself, the name is derived from the Spanish word for “small female pig.” Cochinita’s menu features craft cocktails including a jalapeño margarita and Mexican rum punch. The standard Mexican menu fare can be expected, including tacos, burritos, and quesadillas. However, you’ll also find plenty of modern flavor profiles such as a mushroom taco with zucchini salsa or a Korean-inspired short rib taco.